Buying a Home is Your Business; Inspecting it is Mine. I am in the business of providing valuable information to my clients. I have been a home inspector since 2005 in the Buffalo, NY, and Western New York region, and I am an Associate Member in Good Standing of the American Society of Home Inspectors (ASHI). My home inspections are scheduled 7 days per week at your convenience. Choosing the right professional for a home inspection in Buffalo, NY, and the Western New York region can be a difficult decision. Many home inspectors have varying qualifications, equipment, experience, reporting methods, and pricing. A home inspection requires a great deal of time and work. Ultimately, a thorough home inspection depends greatly on the individual inspectors own effort. 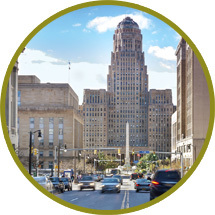 If you honor me by permitting me to inspect your home in Buffalo, NY, and the Western New York region, I guarantee that I will give you my very best effort. I believe that the real test of business and life is helping and sharing with others. I will familiarize you with the home and premises at the time of the home inspection, and I will answer any questions you may have regarding the home inspection process. I will provide you with a comprehensive home inspection report. Should you have any questions about your inspection report, I will be happy to answer them with just a simple phone call. “Excellent: Very Thorough, all questions patiently and professionally answered.